Leaked screenshots reveal that Samsung is planning to release a smart watch of its own, to compete a yet-to-be launched iWatch Apple’s team of designer is reportedly working on. 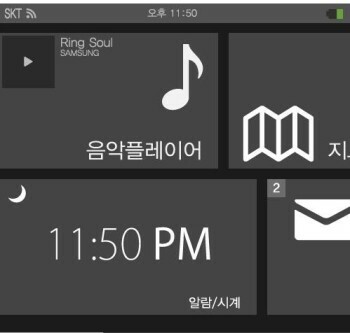 As you can see from the above images, one pictures a name, Samsung Galaxy Altius, while other shows a music player, email app and a clock. While there is no official information that Samsung is indeed working on such a product, the leaked screenshots reveal interesting information about the potential upcoming device. First, the Samsung Galaxy smartwatch doesn’t seem to run Android, but a custom operating system, called Altius OS or Altios. It depends on what image you look at. Secondly, the device is connected to the South Korean Wireless Telecommunication Operator, SKT. What could shed some light on the project is that the upcoming Samsung Galaxy S4 is codenamed Altius(J). From what we’ve learned so far, Apple has a team of 100 product designers working on a wristwatch project. While Tim Cook said Apple is working on new products, there is no ETA for the iWatch. It remains to be seen which one of the two tech giants will launch the smartwatch first, although Sony already launched a smartwatch running Android last year.